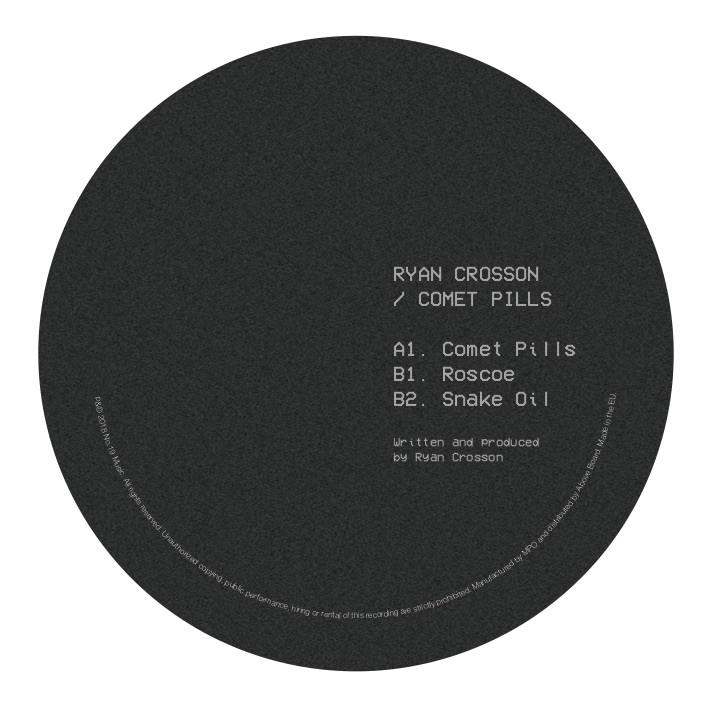 For its next release, No.19 Music welcomes one of dance music’s most celebrated contemporary artists in Ryan Crosson for a new single coming on vinyl and digital. Crosson is a true techno tastemaker who hails from Detroit. He’s released on long established labels like Minus, as well as going on to form Visionquest with Seth Troxler, Shaun Reeves and Lee Curtis, and the label of the same name where he also put out key EPs and LPs with Merveille. From headline sets at festivals round the world via club gigs at the most tasteful venues in the scene, he is a real giant of underground dance music with studio skills to match, as this standout three tracker proves. Superb opener ‘Comet Pills’ is a deep and thoughtful track that encourages your mind to wander off into the cosmos. Slick drums and melancholic chords set the tone, while the bass fleshes things out and sci-fi details bring out a cinematic quality. The brilliantly mysterious ‘Roscoe’ is expertly stripped back and reduced house music that takes you on a trip. It's quick and smooth, with watery sound design, soft hits and muffled vocals adding intrigue to a track that is both cerebral yet designed to make you move. Last of all, ‘Snake Oil’ is another fully realised offering which journeys to the edges of the galaxy, with long lingering ambient pads suspending you in mid-air as squelchy synths and shuffling drums keep one foot on the dance floor. These are three terrific cuts of seriously atmospheric house and techno.